Development of the country's hydropower potential, electrification of rural areas and strengthening of the transportation infrastructure are expected to be the main driving forces behind the growth of the Laos switchgear market during 2018-24. Plans such as the 8th Five-Year National Socio-Economic Development Plan (2016-2020) and the Ten-year Socio-Economic Development Strategy (2016-2025) are expected to spur the demand for switchgears in the country in the years to come. 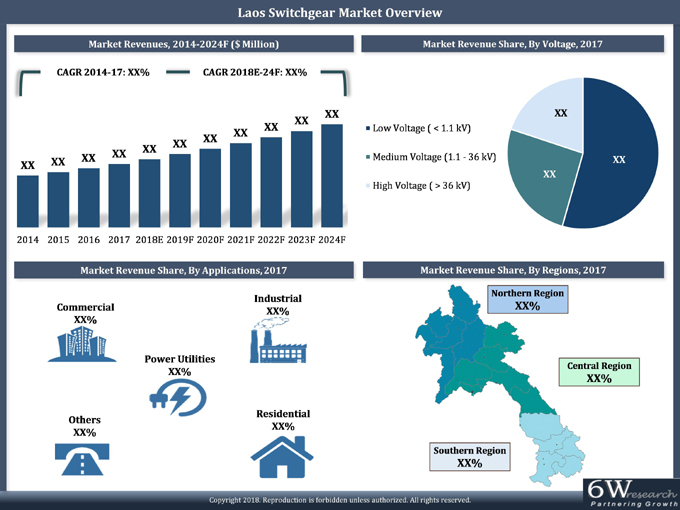 According to 6Wresearch, the Laos switchgear market is projected to grow with a CAGR of 7.2% during 2018-24. The economic growth in Laos is expected to pick up in 2018 on the back of expansion of sales and production of electricity, burgeoning services sector and the construction of cross-border railway projects. Though, Laos's economy is gradually diversifying into retail services, construction and tourism, the country's large untapped hydropower potential cannot be overlooked, and it is predicted that the resource sector would continue to play a major role in the economic growth of the country in the next decade. The strengthening of the power infrastructure in Laos would prove to be beneficial for the switchgear market in the country. Low voltage switchgears dominate the overall switchgear market with the largest market revenue share on account of their applicability across multiple domains. Gas insulated switchgears are expected to gain more market revenue share in the coming years due to the several advantages these offer over their air insulated counterparts. The report comprehensively covers the Laos Switchgear Market by voltage, insulation, types, applications and regions. The report provides an unbiased and detailed analysis of the on-going trends, opportunities/high growth areas, market drivers which would help the stakeholders to device and align their market strategies according to the current and future market dynamics. 13.4 Fuji Electric Co., Ltd.
13.7 Nissin Electric Co., Ltd.
13.8 Chint Group Co., Ltd.